When hemming two edges that meet, the multiple folds along each edge pile up on top of each other and create an excess of fabric at the corner. Mitered corners reduce the bulk, allow the edges to meet evenly, and look oh-so-satisfyingly neat and tidy. Here are two different methods for making mitered corners. 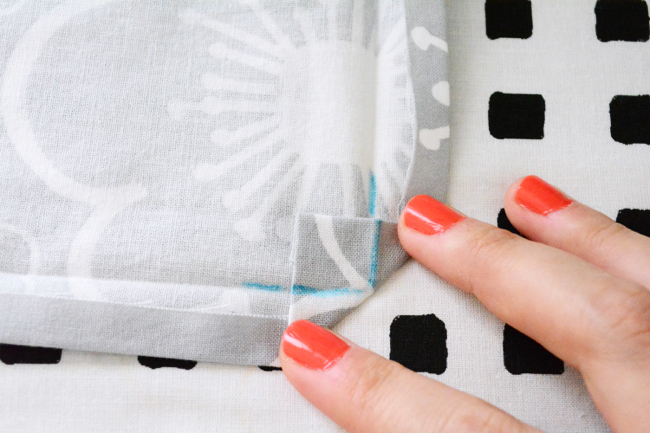 On all edges, press half your hem allowance to the wrong side. Press the same amount again. 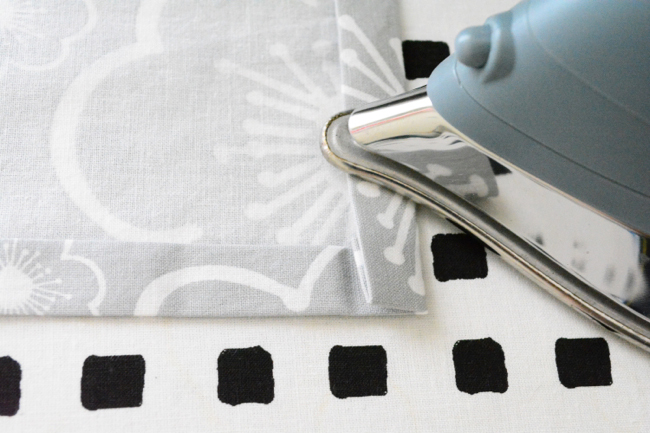 At the corners, make sure you fold and press evenly. It will be bulky. Find the middle square formed by the folds. Mark a line through its corners all the way across as shown. 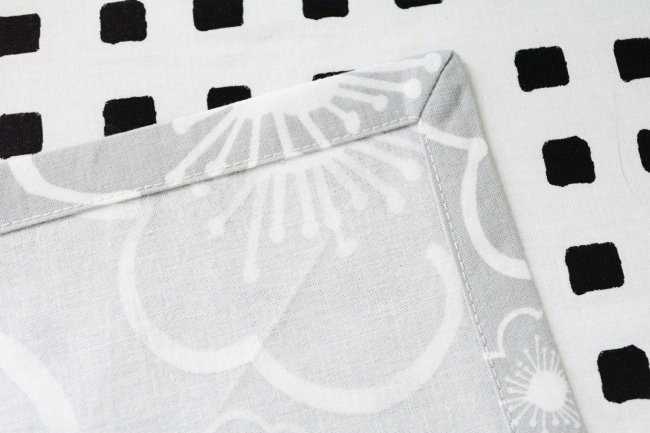 Fold angled edge in so that the creases line up with each other. The creases you should be aligning are marked in blue. 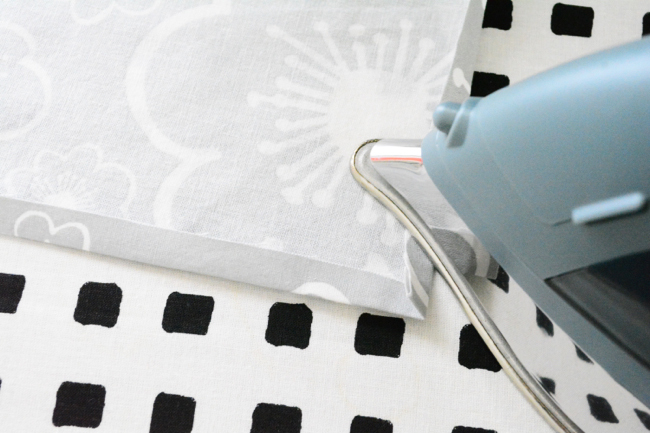 Press lightly, taking care not to press out your other folds. Refold along first fold and press. Refold along second line and press. 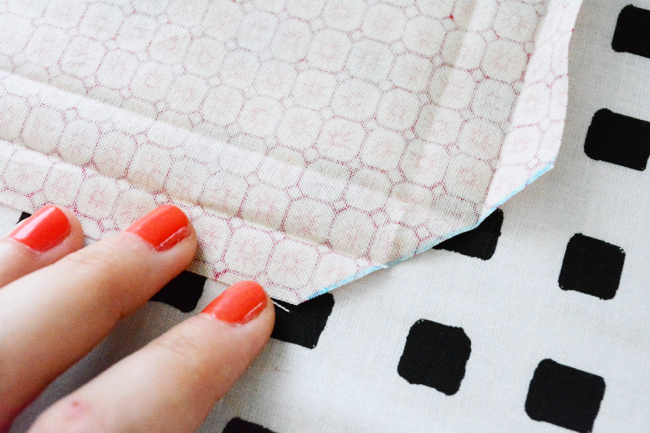 Pin corner and sew around inner fold, pivoting in mitered corner directly between folds. This form of mitered corner is stronger and will stand up to more wear and tear. 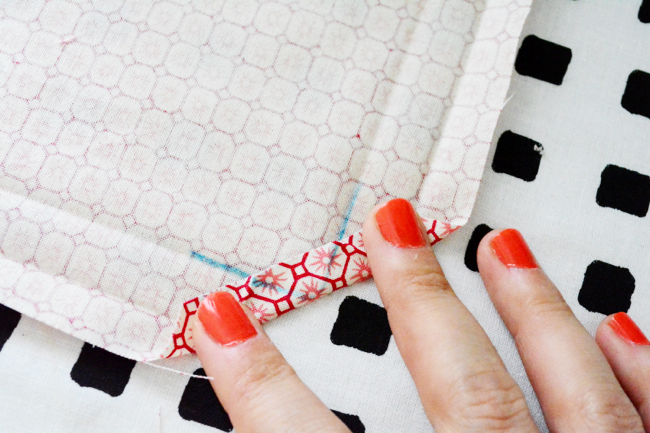 Press half your hem allowance towards the wrong side along both edges. 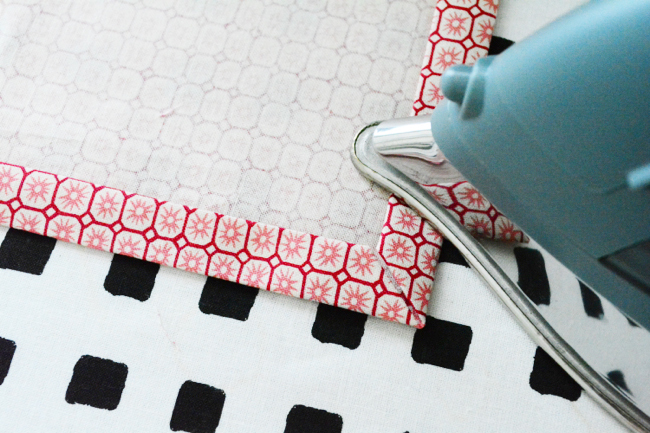 If you divided your hem unevenly, press the smaller portion. 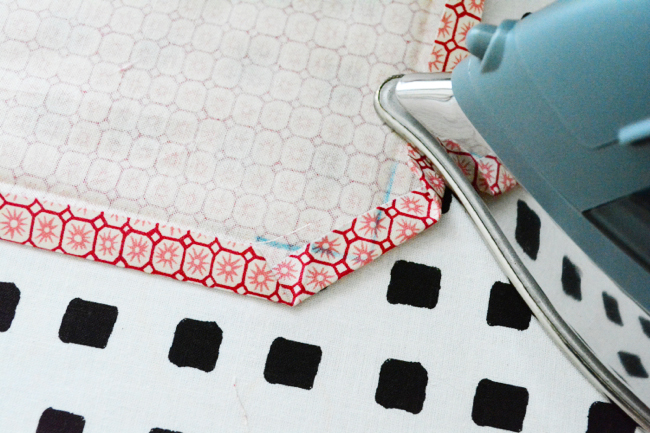 Press half your hem allowance towards the wrong side again. 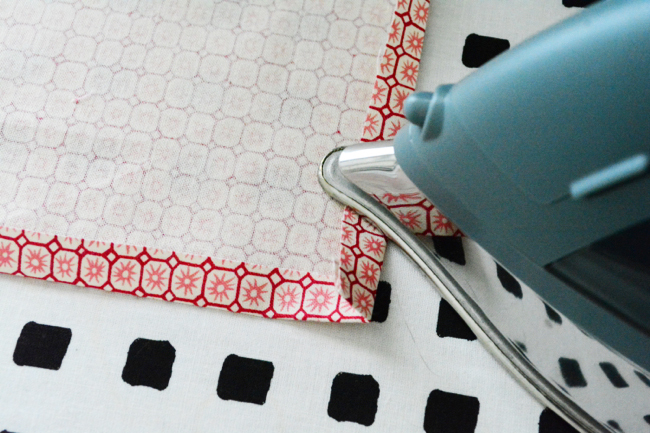 If you divided your hem unevenly, this time press the larger portion. Unfold the second fold only. 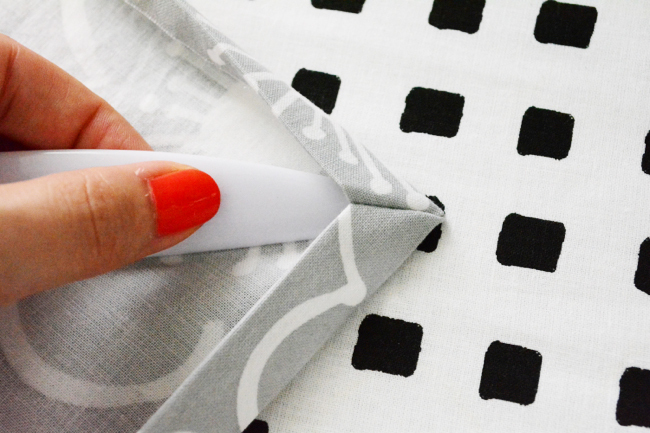 Fold the corner in towards the wrong side as shown so that the creases line up with those from the second fold. The creases we are aligning are traced in blue. Press to crease and unfold. Now fold the corner right sides together, aligning the outer edges. You should be folding so that the most recent crease – the one diagonally across the corner – is lined up with itself through the layers. This crease is marked in blue. Pin. 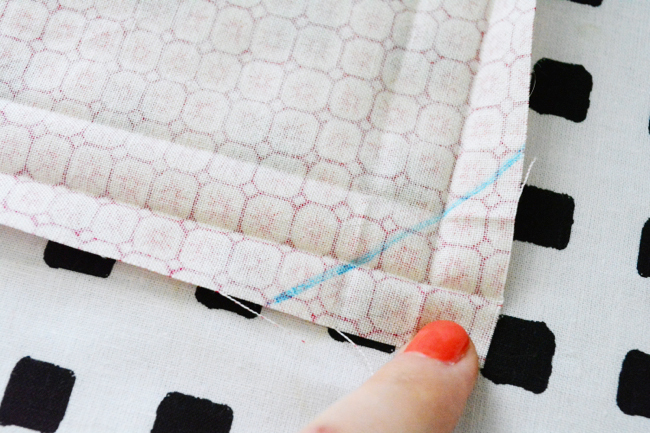 Stitch along crease, backstitching at beginning and end. Cut off excess and clip top corner. Turn corner right side out and use point turner or chopstick to push it out. 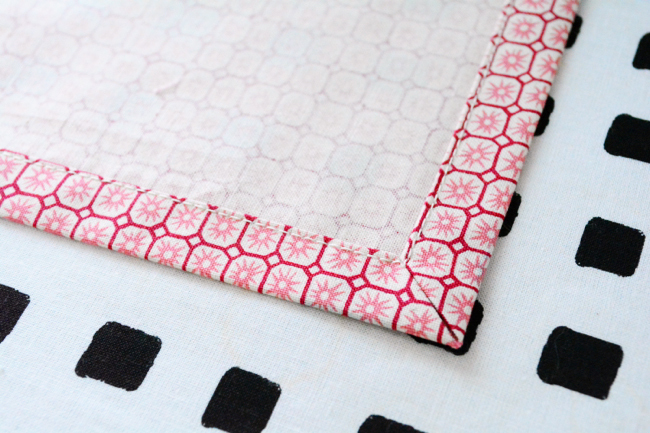 Press, then topstitch around free inner fold, pivoting at the corner. Brilliant! Just what I need! So helpful, thanks! I’m eagerly awaiting this hem guide you’re putting out. 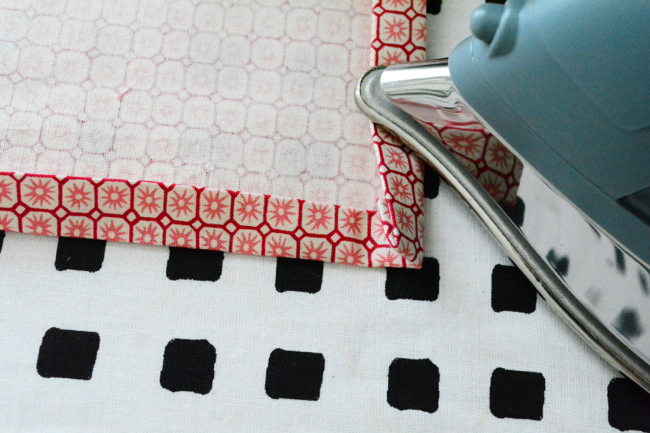 Will all of these hem issues you’re posting on the blog be in the guide? It’ll be great to have one handy resource for my hemming needs. You ladies are awesome! Thank you so very much for making everything so very easy to see for those of us whose eyesight doesn’t keep pace with our vision! 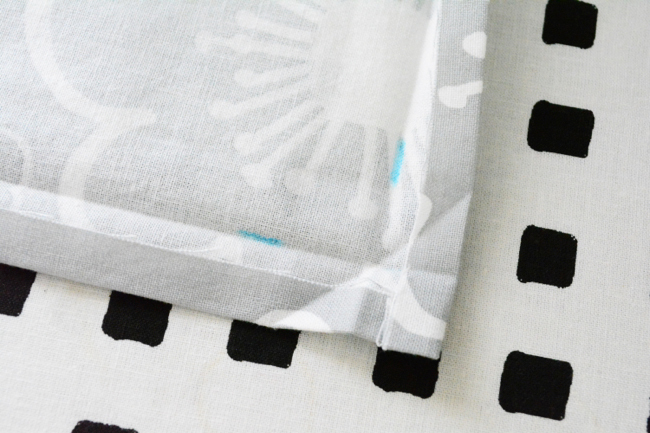 I’m making a million napkins using Kaufman Essex Linen, and recommend the “Sewn and Topstitched” technique. 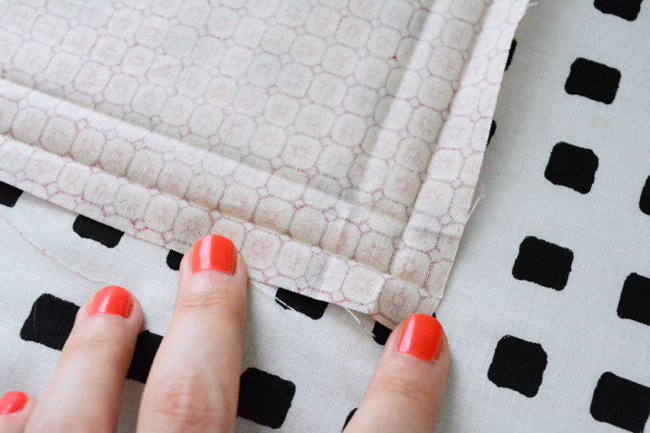 This is worth doing in a couple of test runs on your fabric’s scraps, if it’s really important to get an exactly square corner. I get the smoothest, flattest, squarest corners by angling the short stitching line to be a little less than 90 degrees. (Find the photo of the clipped corner which is third from the bottom, above. 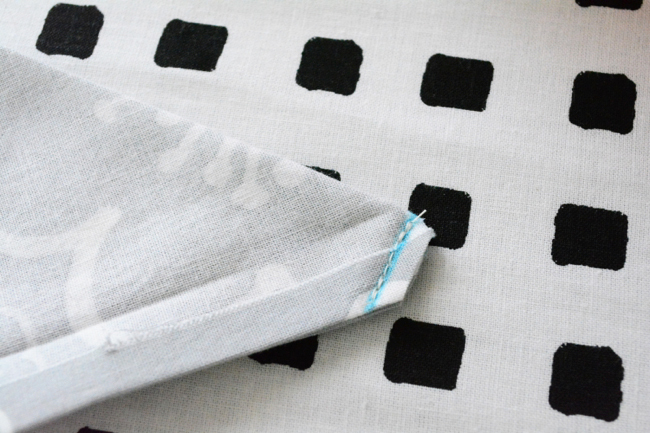 Imagine that the “bottom point” of the stitching line is nudged a tiny bit toward the center of the napkin.) 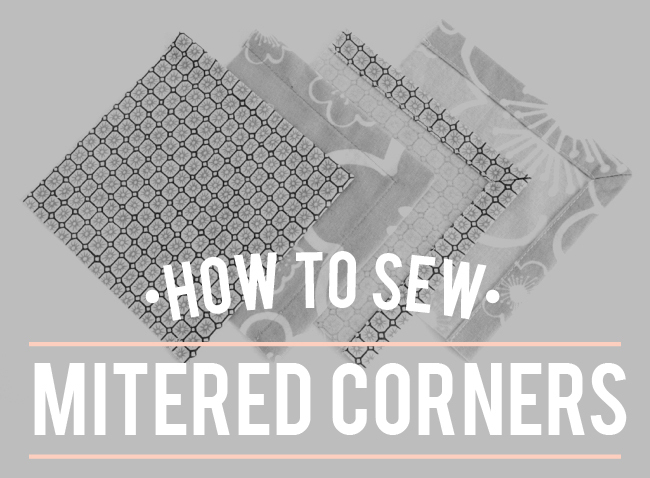 This snugs up the corner better and helps get a flawless topstitch with no puckers. This is so clear and useful. Thankyou – you’re a champ Devon! Even though the first one is the lesser sturdier of the two, I have never gotten as clean a finish with the second method. Thanks for this tutorial! Thank you so much for this tutorial, the resulting corners are lovely ! This is such a great skill I have never understood or honestly taken the time to understand. Super excited about the all the new stuff I can make. Specifically, I am going to replace the only set of cloth napkins we have which are not at all our style. Thank you for so many amazing tips and tricks! Devon makes such great tutorials… this is really clear, and really useful! I’m inspired. I just raided my scrap bin to cut out a bunch of cotton handkerchiefs. They’re pressed and waiting for the next time I get to the sewing machine! They’ll be perfect for those blustery fall days. I have beeen browsijg online more than three hours today, yet I never found any interesting rticle like yours. Really nifty tutorial, thank-you! Can I ask what fabric you’re using here? I’ve been doing a less-tidy version of the topstitched for my family’s cloth napkins. Because I can’t eyeball anything and be accurate but I don’t want to mark every side, I sew a basting stitch where I want to do my first pressing. It takes a little time to take out the stitches, but I’m much happier with the results. Plus, my brand-new-to-sewing nine year old daughter is getting a lot of practice sewing straight. 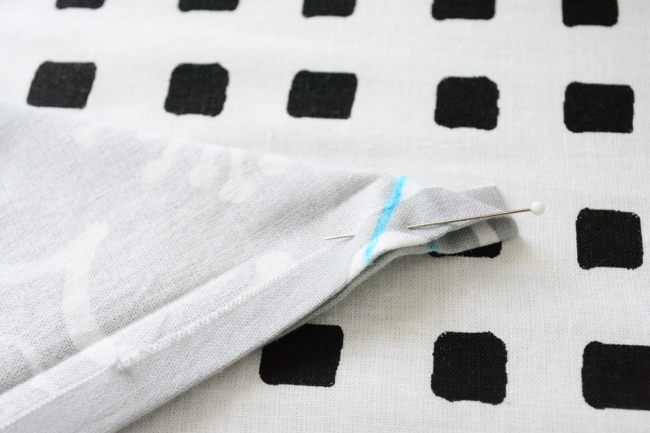 The basting stitch will also be a good way to introduce her to pressing seams…and ripping out stitches. I will try both of the above techniques when I make something that I will give away. Or when I make nice holiday napkins for myself. If you are wary of rooftop installation, you can go in to get a dealer who sells the antenna as well as gives free installation with it. you everything you need to own an incredibly home theatre system that actually works perfectly, every time. antenna will often be larger compared to the inside of one’s home. TV stations are carried in digital by having a TV antenna. motorized outdoor hdtv antenna The Panasonic Viera TC-l37S1 37″ LCD HDTV offers full 1080p resolution approximately $850. This isn’t so a lot of a problem today, however, if HDTVs were getting their start, many TV companies lured in customers with promises of HD which has a special type of TV called an EDTV. No more does one ought to tune in to a obsolete satellite antenna and savor a ‘chitrahaar’ inside midst of frequenting electricity supply. Winegard hd8200u outdoor hdtv antenna reviews They don’t seem to realize that no matter the cost with the TV they buy they will not have that signal minus the antenna. get nerfed… specially in Pv – P or conflict oriented games. that also includes little elements. being an adjunct to interactions between parent and caretaker, not being a substitute for an adult’s participation inside child’s play. yellow, orange, pink, mauve, and purple. ‘ A bouquet composed of only of standard-sized white callas look one-dimensional. may be the perfect message to send using a gift on the special first anniversary. sofa to ensure that you are choosing the proper sofa or sofa recliner to suit your needs. the piece of furniture store again for changing the sofa. This will help you see whether or not the sofa bed is of high quality or not. of pieces than the one piece you might see inside our homes.